In pre-internet days, when you couldn't zoom anywhere on the planet using Google Earth or Google Street View, globes were mesmerizing devices that could keep us entertained for hours on end. Now, Orboot wants to bring some of that magic back, using Augmented Reality. I sill fondly remember the time I spent scouring globes, and the games we invented around it, like "find the city". It also felt like magic having a lighted globe with a small "light point" that we could use to pinpoint a specific location anywhere on its surface. But, put one such device at the hands of a kid these days, and they'll certainly be bored with it in just under a minute. Well, that's why Orboot, now on Kickstarter adds something extra. 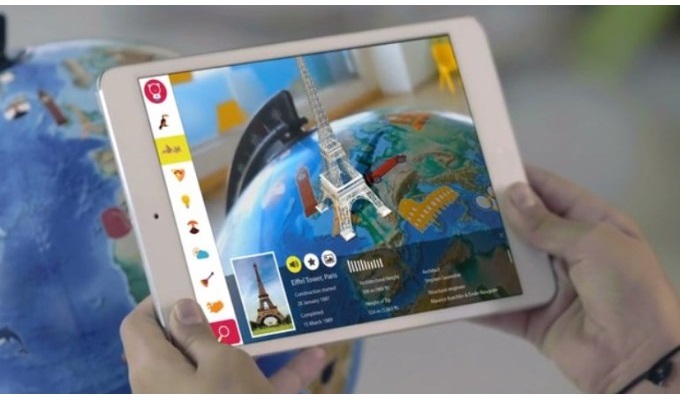 Instead of an old fashioned globe, Orboot relies on an added dimension of Augmented Reality to bring the globe to life with a plethora of information regarding the countries we're looking at. Prices start at just $29, and I bet it can inspire children to create the same sort of fond memories regarding this globe, similar to the ones we had regarding the old globes.